“That’s my guy,” Ali said. Ball and Indiana Pacers Aaron Holiday, TJ Leaf and Ike Anigbogu returned to their old stomping ground to see UCLA dismantle Hawaii 80-61 on Wednesday night. They visited the locker room before the game, even though only two current Bruins were on the same team as any of them. Like Ball, Leaf and Anigbogu were in Westwood for one year before heading to the NBA. Holiday stuck around for three seasons. “To have all those guys in the locker room, that’s fun,” coach Steve Alford said. Ali scored a career-high 23 points and the Bruins (5-2) rebounded from consecutive losses to ranked opponents. Kris Wilkes added 16 points for the Bruins, who made 10 3-pointers. They hit 11 in a 16-point loss to then-No. 7 North Carolina last week at the Las Vegas Invitational. That followed a 20-point loss to No. 11 Michigan State. Hands had a career-high 11 of UCLA’s 16 assists. The Bruins led by 20 points in the first half, when Ali didn’t miss a shot. He made all six of his field-goal attempts and was 4-of-4 from the free-throw line. “I’ve been working on my game and it showed tonight,” Ali said. UCLA opened the game on an 18-5 run, hitting four of its eight first-half 3-pointers during the stretch. Wilkes had a highlight dunk with a one-handed jam late in the first half after 7-1 freshman Moses Brown and Jalen Hill dunked. Brown finished with 11 points and seven rebounds. “They have talent from positions one through eight and they have guys that come off the bench and there’s no drop-off,” Hawaii’s Jack Purchase said. Owen Hulland scored 14 points for Hawaii (4-4) in the first meeting in 18 years between the teams. The Rainbow Warriors’ first eight games have all been decided by double digits, with the Bruins handing them their worst loss so far. The Rainbow Warriors were held to 27 percent shooting in the first half. UCLA opened the second half in similarly dominant fashion. 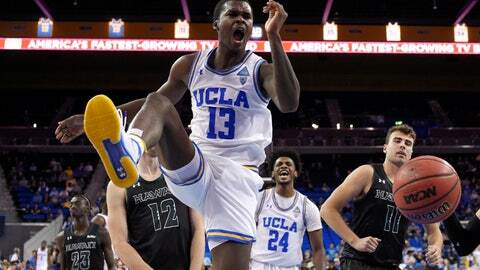 The Bruins outscored the Rainbow Warriors 17-9 and extended their lead to 62-35. They did it with balanced scoring: Cody Riley had six points, Ali added five and Wilkes four. Brown got things started with a putback dunk. Purchase and Brocke Stepteau added 10 points each for Hawaii. Hawaii: The Rainbow Warriors return home to play seven straight home games after concluding a four-game visit to the mainland. They went 1-2 at the Wooden Legacy tournament over Thanksgiving. UCLA: The Bruins were knocked out of the rankings after losing to Top 15-ranked teams in consecutive games at the Las Vegas Invitational for the first time since Nov. 22-23, 2011, at the Maui Invitational. They’ll try to get back into the Top 25 with wins against four straight home opponents: Hawaii, Loyola Marymount, Notre Dame and Belmont, which owned a combined 21-4 record coming into this week. “We passed the first test,” Alford said. Ball and Holiday sat together on one baseline, while Leaf and Anigbogu sat together on the other. The Pacers are in town to play the Lakers on Thursday. Former Bruins great Jamaal Wilkes and Toby Bailey, who played on UCLA’s last national championship team in 1995, were on hand, too. Riley had eight points and seven rebounds in 23 minutes. He didn’t play in the Bruins’ first three games because of a jaw injury, but has gradually built his minutes up coming off the bench in his last four. “He’s a big body, he’s a hard person to guard,” Wilkes said. Riley was suspended all of his freshman season for his involvement in a shoplifting incident in China last fall. Hawaii: Hosts Hawaii-Hilo on Dec. 8. UCLA: Hosts undefeated Loyola Marymount on Sunday. The teams last played in 2011.